I met up with Ben and his crew for lunch today because I heard they were going to Peaceful Noodle, which is one of my favorite noodle houses. Almost every dish I’ve tried there is good, but it’s hard not to order the “same old, same old” when they’re so good! We started with the Peaceful beef roll, which is the dish that originally drew me in to the restaurant. 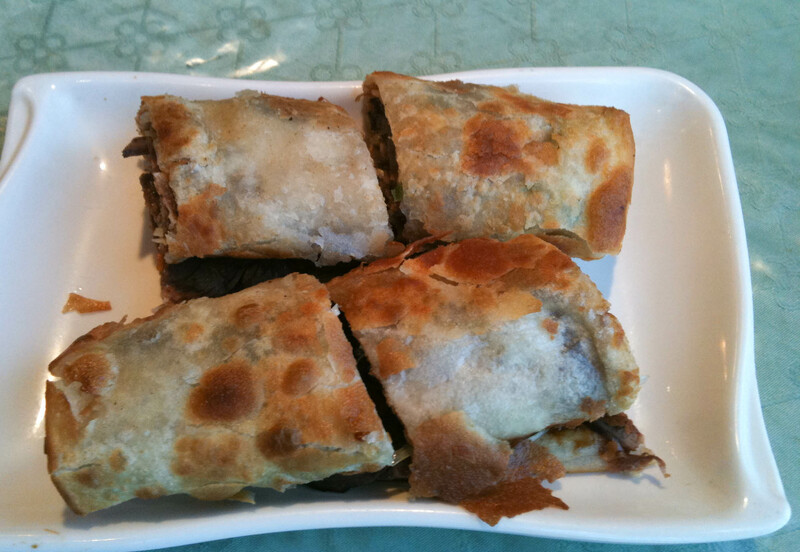 It’s thinly sliced beef and hoisin sauce slathered and rolled in a thin crisp and fluffy green onion pancake. Every time I eat it, I think how much my brother would like it because it’s so much like Peking duck, first course. Perhaps I should have taken a photo of the inside so you could see how nicely its rolled up with beef. 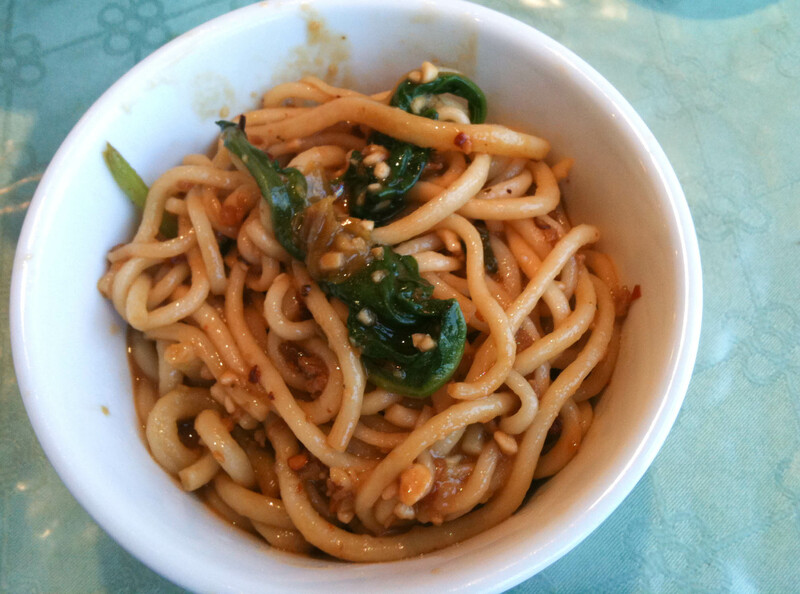 The Dan Dan noodle is another yummy must. The noodles have a great chewy bite to them and soak up the deliciously spicy peanuty broth so well. This is one of those dishes thats highly addictive for me. The more I eat it, the more I cant get it out of my head. Maybe itll replace the ground pork and oyster congee I seem to still be eating 3 times a week. 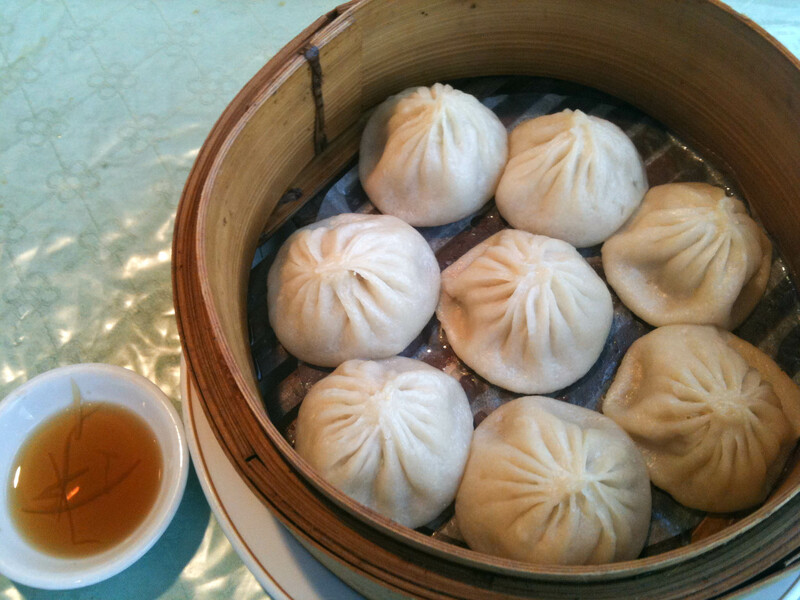 Their Xiao Lin Bao aren’t my favorite in the city because I think the wrapper is too thick, but from what I’ve read, Peaceful’s cooking style is Northern Chinese which means it’s supposed to be “heartier”. Either way, I like my dumpling wrappers to be more delicate. The only good thing about the thick wrapper is that it tends to not rip as easily as the thinner ones, which protects the soup inside the dumpling. You can tell though that at least 4 of these dumplings have already split open and spilled their soup. After these 3 dishes it’s always a toss-up with what to order. But it seems more often than not, when I go with Ben’s lunch crew, we end up with the Peaceful House Noodles with meat, seafood and vegetables in a chili garlic sauce. Since there were 5 of us, we decided to get an extra dish. 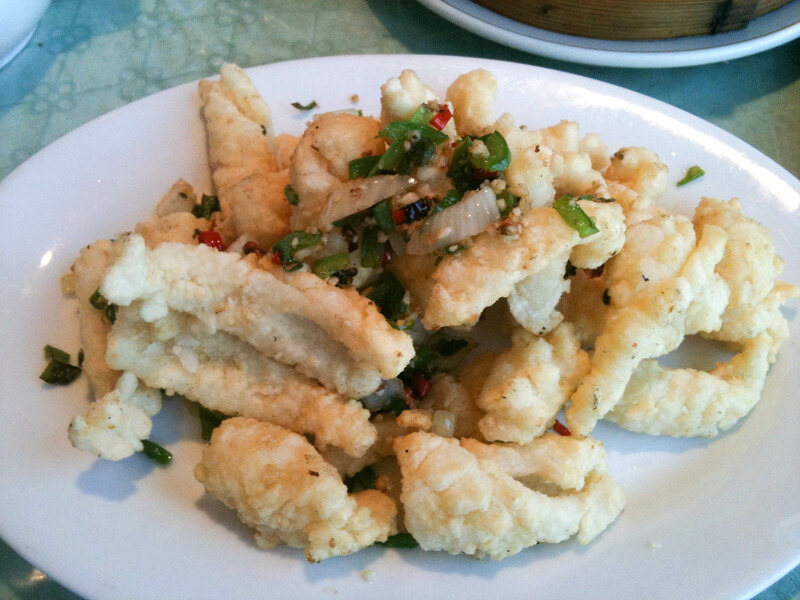 We chose the deep-fried spicy salted squid. 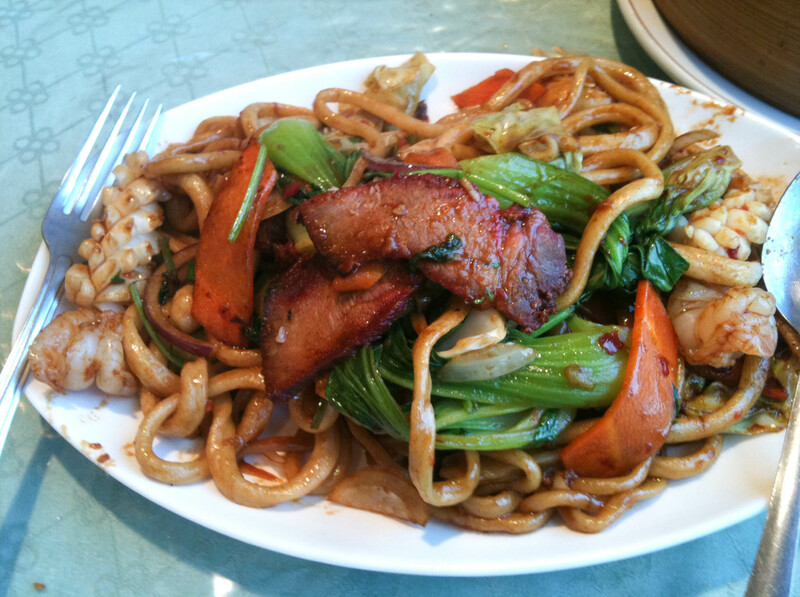 This is one of those dishes that gets ordered a lot out at Chinese restaurants in my circles. Who doesn’t like deep-fried squid? I was a bit worried at how light in colour the coating on the squid was because I thought meant they were under fried, but they ended up being so tender, I looked past the colour. I like to pile on the chili pieces and garlic on to each piece to get a flavour boost with each bite. If you haven’t been to Peaceful before, go. The food is so flavourful and reasonably priced as well. There are tons of other dishes that are worth a try as well. Actually just thinking of it, makes me want to return for a Dan Dan noodle and maybe a side order of chili wontons. Nothing like a couple of spicy dishes to beat the heat of summer! everything looks so good. where is this restaurant? This is without a doubt our favorite lunch spot. The food is so good, consistent and cheap! They don’t take credit cards so be aware….but they are open until 10pm! This blog write up does it justice! Great work! Maybe I will go there for lunch….